Customer Appreciation Sale and FREE Spin! 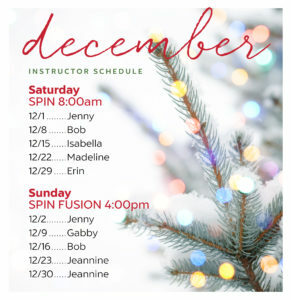 Here is our December Weekend Instructor Schedule!!! Don’t forget about the Sunday 8:30 a.m. 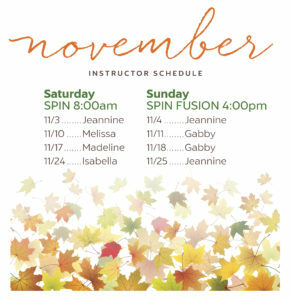 Spin with Colleen every weekend! 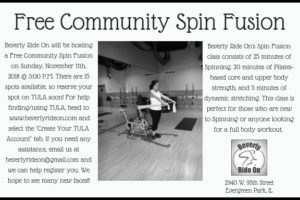 FREE Community Spin Fusion Sunday, November 11th at 3:00 P.M.
We will be hosting a FREE Community Spin Fusion on Sunday, November 11th at 3:00 P.M. 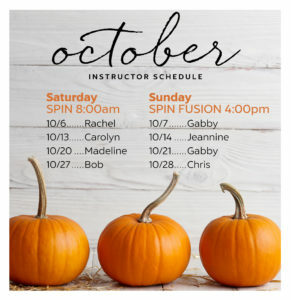 This class is perfect for anyone who has never taking a Spin class before or for those who are unsure if they can do a Spin class. This 50 minute class includes 25 minutes of Spinning, 20 minutes of arms, back, and abs work, and 5 minutes of dynamic stretching. Spots are limited, so sign up on TULA soon. If anyone has trouble figuring out TULA/registering refer to out website or email us for help @ beverlyrideon@gmail.com. We are so excited and hope to see many new faces!!!! 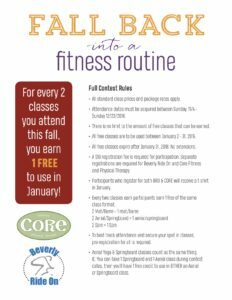 Ready to Fall Back Into Fitness? 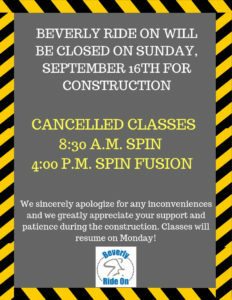 Beverly Ride On is here to help! Sign up for our challenge that goes from November 4th to December 23rd and every 2 classes you attend during that period you will earn 1 free class to use in the month of January. Sign-up instructions, fees, and rules are posted in the flyers below. 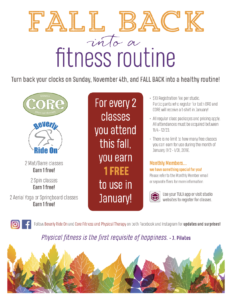 Another perk to the challenge is that we’ve partnered with our friends Core Fitness and Physical Therapy and they are also doing the Fall Back Into Fitness Challenge. For anyone who signs up for both Beverly Ride On and Core Fitness will receive a t-shirt at the end! Sign up on TULA today and if you have any questions, feel free to contact us @ beverlyrideon@gmail.com. Plan ahead!! 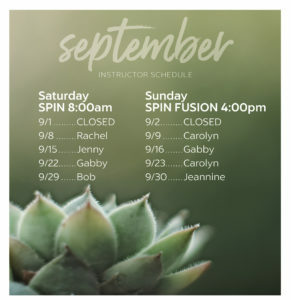 Here is the September Weekend Instructor Schedule. Note that Colleen will be taking over the 8:30 a.m. 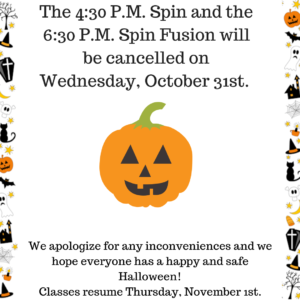 Spin on Sundays and the Sunday 4:00 p.m. Spin Fusion is back. Hope to see everyone in the studio this weekend! !